AFT Connecticut is nearly 30,000 hard-working women and men from more than 90 local unions throughout the state. 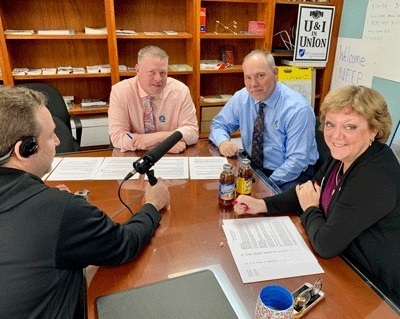 The first episode of the state federation’s new podcast series is hosted by AFT Connecticut President Jan Hochadel, along with Council 4 AFSCME Executive Director Jody Barr. The focus of their conversation is the impact of the state legislature on union members, their jobs and communities. Their guest is state Rep. Joe Aresimowicz, the speaker of the General Assembly's House of Representatives and education coordinator for Council 4. He answers union members' questions on state budget and local school district regionalization proposals that lawmakers are currently deliberating. AFT Connecticut's podcasts serve to provide a deeper dive into issues impacting members and the wider labor movement as part of the state federation’s engagement and communications programs. Breaking news, event announcements, and urgent actions are also posted at the union’s Twitter feed, Facebook page and website. * Be sure to include your full name, local union and employer. Copyright 2019 AFT Connecticut. All rights reserved.